The Rabbi with a Blog (Rabbi Jason Miller): New Name for Conservative Judaism? New Name for Conservative Judaism? It's not unusual for a company to change names following a high-profile scandal. Philip Morris famously changed to Altria, Blackwater became Xe, ValuJet became AirTran, and Andersen Consulting became Accenture following its involvement in the Enron scandal. Cingular became AT&T, and the WWF became the WWE. I wouldn't be surprised if BP changed its name after the recent disastrous oil spill in the Gulf. Other companies have changed names to better explain what they do or to improve their image. I've long held the belief that the Conservative Movement of Judaism needs a name change and a brand re-imaging. It now looks like the titular head of Conservative Judaism, Jewish Theological Seminary Chancellor Arnie Eisen, agrees. While there's no scandal in the Conservative Movement, the number of adherents has dropped significantly and the name doesn't resonate with people. The term "conservative" has been appropriated by the political conservatives, not to mention it doesn't fit well with the middle-of-the-road Jewish denomination anymore. The Forward reports that Eisen "acknowledged that the movement's name is now being debated" at a recent meeting with its editors and reporters. Eisen told the journalists that he was open to a name change when asked about that possibility. "Leaders of Conservative-affiliated organizations want to find a name that will better capture what they want the movement to represent," he said. In typical fashion, the movement's leaders are not all on the same page. The Forward article goes on to quote Rabbi Steven Wernick, the new executive vice president and CEO of the United Synagogue of Conservative Judaism, "who said that this is not the time for his movement to be discussing a name change." Eisen said that "The leading candidate right now, I think, is just to go with the name 'Masorti' (traditional), which captures things better than the word ‘Conservative’ captures them. So I am open to suggestions; I am open to a name change." Masorti is the name used by the Conservative Movement in Israel and outside of North America. The Forward solicited suggestions from a wide range of people as to what new name they think the Conservative movement ought to adopt, if any. Comedian Judy Gold suggested it be renamed the "I Eat Treyf Outside the House" movement. 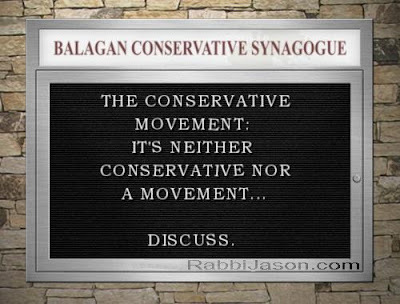 The Orthodox spokesperson Rabbi Avi Shafran (director of public affairs for Agudath Israel of America) urged that the Conservative movement “not change its name, which is an important reminder that its foundational raison d’être was to conserve Jewish observance in the face of Reform." Rabbi Shaul Magid, a former JTS professor of Jewish philosophy who is now a professor of Jewish studies at Indiana University, proposes that the movement now be called “Historical Renewal,” to reflect both its roots and its desire for spiritually focused growth. Personally, I like my colleague Rabbi David Wolpe's suggestion that the movement change its name to "Covenantal Judaism." But if I had to come up with my own suggestion it would be "Evolving Judaism." The name doesn't have to sum up everything for which the movement stands. That is the purpose of a mission statement and guiding principles. For me, I have embraced Conservative Judaism because it acknowledges that Judaism is fluid and always evolving. Yes, the Tradition is conserved as it evolves, but to speak to people's modern sensibilities the emphasis should be on change. For an accurate Yiddish name, I'd recommend nisht ahin, nisht aher (neither here nor there) to underscore that Conservative Judaism is neither Orthodox nor Reform. I appreciate what branding guru Rob Frankel said when asked by the Forward for his opinion of a name change for the Conservative Movement: He said that there was no point in changing the Conservative movement’s name if the movement does not first decide what its essential message is." I suppose that the hard work is figuring out the message for a middle-of-the-road brand of Judaism in the 21st century. If it's just about a cool, new name, I'd recommend "Google" -- even if it's already taken, it would guarantee a lot of visits to the website. I find it interesting that you have to call Eisen the "titular" head of the movement; this belies the fact that what we call the Conservative movement is not the name of any one organization at all. Ismar Schorsch, the immediate past chancellor of the Jewish Theological Seminary used to refer to himself in his bio (and hence when he was introduced) as the "titular head of the Conservative Movement." I know that Arnie Eisen does not use that term and I don't know if he considers himself the titular head of the movement. I like to use the term because I think Eisen should be the head of the movement and we should reconsider if it's even necessary to have USCJ. I wonder if USCJ shut down, how long it would take most Conservative rabbis and members of Conservative congregations to realize it. I love "Masorti." But would it would bring any more people to the movement than "Conservative." Words that come to my mind to call ourselves besides Masorti and Traditional (which I like), are Moderate (or Moderated), Mainstream (though that might raise the hackles of other Jewish movements), Standard (but that sounds like oil) and Contemporary. The reason I choose to belong to this movement--Masorti, Traditional, Conservative, or whatever it may be called--is because it holds to tradition without being stuck in a bygone era, unaware or unmoved by changing times. The changes we make are based on the traditions of she'elot and teshuvot, keeping our traditional texts in mind, but recognizing ongoing changes in life. I can't say those things about Reform, Reconstructionist, Orthodox, Renewal, or any other Jewish movement. 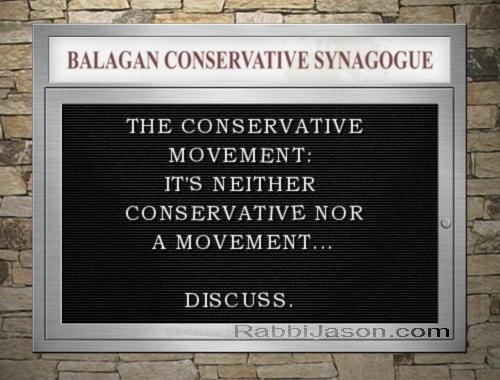 Though it is true that the congregants at synagogues who call themselves "Conservative," often do not act in as halachic a way as the movement would suggest, I find that position to be inspirational. I'd rather be reaching for more, than have nothing to reach for. The movement would do well to put some money to the question, and rather than deciding based on the opinions of movement leaders, find out what the general Jewish public in the U.S. would actually be drawn to. That is, hire a professional company to conduct a nation-wide poll on the issue. If we are to be a contemporary movement, and attract our contemporaries, we would do well to use the tools of our time, to figure out how to be most successful at this endeavor. Changing our name once is hard. Changing it again, later, because we chose wrong...I shudder to think. how about changing the name to: " The New Jewish Home For The Blind "
How about if we call it "Torah True Halachic Judaism", thereby properly claiming that space from the Orthodox! How about Obamism? Blacklivesmatterism? Social Justice Warrior Cause du Jourism? That's what my "Conservative" former shul has gone to, though they wouldn't say that out loud.